Heartwarming and inspiring stories for women. Bask in the glow of winter’s warmth. Celebrate the most blessed time of year with lighthearted tales, original stories and poems, and quotations… all wrapped up and ready for you to open and enjoy. Now also available with a bonus music CD! Get the book and CD together for just $19.95! 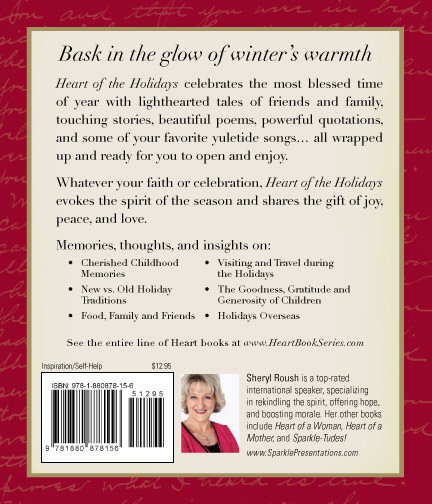 Heart of the Holidays Amazon Kindle Edition eBook available. Click Here. Heart of Christmas Amazon Kindle Edition eBook available. Click Here. Heart of Thanksgiving Amazon Kindle Edition eBook available. Click Here.